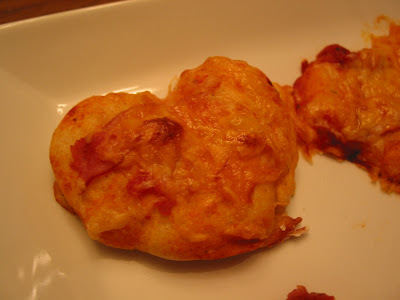 The other day my daughter wanted to make a heart-shaped pizza for dinner (like they do at Papa Murphy's for Valentine's Day). She helped me roll out the dough and then decided to use heart-shaped cookie cutters to make little heart pizzas. Then she finished off the pizzas with sauce, ham and cheese. They were cute and yummy! A fun idea for Valentine's Day. 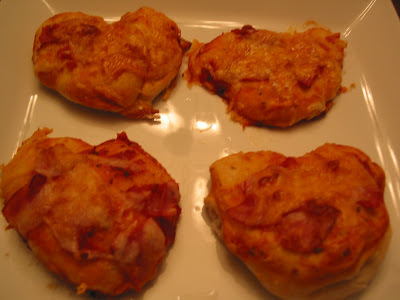 Here are my two favorite pizza dough recipes, a yummy recipe that needs to rise and a quick and easy recipe. Both are great! If using a breadmaker, put all ingredients inside and set it on the dough setting. If using a kitchenaid, mix all ingredients using dough hook and let rise for about an hour (give or take). Roll out dough and put in one 12" round pizza pan. Let rest for 10 minutes. Add toppings. Bake at 400 for 15 - 20 minutes. Mix yeast and warm water. Let stand for 10 minutes. Add other ingredients. Knead for 10 minutes. Roll out and top with toppings. Bake at 450 for 8 - 10 minutes (I usually end up baking mine for 15 minutes).